Most people have found an outlet to let out any pent up frustrations in online games while others find the quiet solitude of an aquarium relaxing. But putting these two elements together? Well, it’s downright insane, in a good way. This virtual tank mixes the elements of soothing fish but infused with arcade style playing that makes for the player if they bite off more than they can chew overwhelming. But fear not with this game, not only do you have your enemies that will disturb your solitude you can collect aquarium friends to help you take care of your virtual tank and defeat foes. You see Insaniquarium starts out innocent enough; it begins with only a few fish in the tank where you feed them and watch them grow. Important note, feed the fish or they turn green and die. As your fish grow they begin to drop coins which you must collect so you can buy more fish and more food. But beware the sanctuary is about to be invaded by aliens! With fish fleeing for their lives and starving in the process as you are clicking furiously with your mouse to keep the alien from your fish, quickly upon defeating your foe feed your fish. Even as relaxing as it is to feed the fish as they swim around, greed does tend to get the better of you as you start collecting more coins and feeding more fish but don’t forget to buy the eggs! Eggs are important in this game as it serves two fold, one, once you collect all of the required eggs you advance to the next level and two, the eggs contain nice helpers in your quest for aquarium dominance! One of the best things about this game is the pure insanity it was to put the two together but it is a hit with players around the web. What begins as peaceful serenity becomes a manic clicking fest as enemies are defeated with the click of a mouse. Coins are collected by the player or a friendly snail that slowly moves along the bottom of the tank collecting them for you. But even in the insanity of the game is rather addicting once you get going. Collecting money to buy more fish, then more food that you can upgrade with vitamins to make the fish grow faster and drop coins worth even more money. Pick up power levels to help fight the creatures that intend to wreck havoc on an otherwise peaceful albeit crowded tank. So in reality Insaniquarium really accomplishes two things, the peaceful setting of a virtual fish tank infused with the fun of an arcade game. 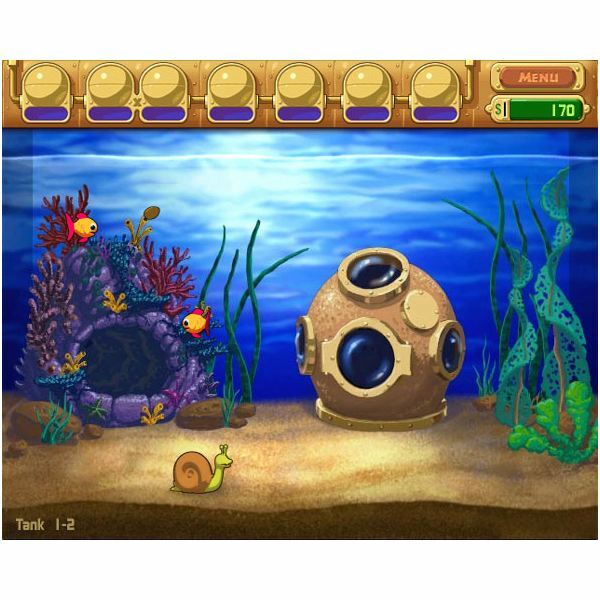 Screenshot credit: Real Arcade and you can download Insaniquarium from them by following this link.